Jonathan Nevius/ The Minaret Some students waited over 2 hours at the campus post office last week. With students back on campus, the post office has become a major destination. Many students have ordered books and had care packages sent to their campus address. However, long lines have prevented some students from picking up their shipments. 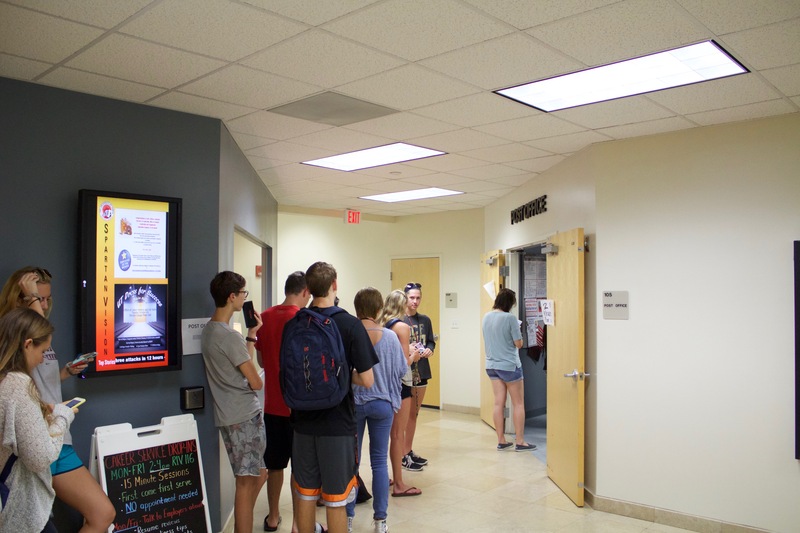 Many UT students schedules are so busy with school, work and extracurriculars that some determine that waiting in the line is not an option. Kathy Fryer, the mail service supervisor, anticipated a busy first few weeks at the post office and prepared with the hiring of additional staff members and by adding weekend hours for the first two weeks of school. However, what was not anticipated was the volume of packages that began arriving the week of orientation. On Friday, Kathy Fryer sent a letter to the editor of the Minaret apologizing for the long lines and the inconvenience to students. As a result, the post office has taken initiative to make needed changes to improve the process, and the first step was clarifying how the post office’s system worked. Many students, according to Fryer, are coming to the mailroom before receiving an email from the post office that their packages had arrived. Although the the online tracking information may confirm that the package has arrived, it will not be registered as arrived until properly checked in by the staff. Another change students might have noticed is the addition of a second line in the post office. Fryer said that this was done so that students can wait comfortably indoors. In addition, the post office staff would like to include more lines in the future. Although the post office lines have been a concern among students, it might be a part of a bigger trend among colleges in the nation, as a result of the increased popularity of online shopping. According to a Forbes article, internet sales rose about 23 percent in 2015 and are expected to increase at that pace again in 2016. In the past, the lines have become shorter as the semester continues. According to Fryer, the post office staff noticed the lines slowing down last week and plan to monitor this throughout the semester and adjust as needed. If students have questions or suggestions, they can contact Fryer at kfryer@ut.edu. A New online retail store.